Training in classical ballet at Regina Knispel (Wuppertal), Karin Thierbach (Solingen) and Yves Casati (Paris). Pantomime - Study with the famous Marcel Marceau in Paris (École Int . Mimodrame de Paris, Marcel Marceau). 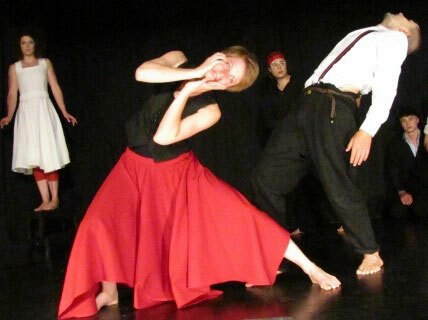 Diploma - Education in physical theatre in London at the International School of Corporeal Mime (technique Etienne Decroux with Steven Wasson / Corinne Soum). Graduated to: BdR - Back schoolteacher, legato-body educator (Method R. Knispel), moderator and speaker. Since 1997 Nicoletta Dahlke is working as mime. She was member of several European companies, including the Théâtre de l 'Ange Fou and Compagnie Lina do Carmo. In 2000 she founded her company "Mimentheater Köln", with whom she has plays his own solo and ensemble productions. Since 1998, Nicoletta Dahlke works as teacher for mime and dance. So she was teaching at the Theaterschule Wuppertal and at Constantin Drama School in Bochum. 2005 Opening of MimeCenter Cologne. Education in Mime / Physical Theatre at MimeCenter Cologne (Diploma). Further training in contemporary dance with Susanne Dickhaut. Performer and director at the Mimentheater Cologne for commercial events and theatre - e.g. with the production "AИDEЯS" of the Mimentheater Cologne. B. Becker is part of the team of lecturers of the MimeCenter Cologne. So he is also teaching improvisation a composition for fulltime education class “Physical Profession”. Furthermore he works as music pedagogue and composer. He studied at The Comedy School of Copenhagen and at the Ecole Int. de Mimodrame de Paris Marcel Marceau. Diploma - Education in Physical Theatre at the International School of Corporeal Mime London (technique Etienne Decroux). Training in post-graduate course in corporeal mime dramatique and pedagogy. Teaching at "Die Etage" in Berlin (private school for Performing Arts). Lecturer Movement Training for Actors at the "Mime Centrum Berlin". In addition, management of national and international workshops in corporeal mime movement and theater / drama training. Performer and director in various European companies, such as the Théâtre de l'Ange Fou, Masholl theater, a pipe dream company, Compagnie Aquanaut, Mimentheater Cologne.